With the new and improved renovations to Krawk Island, many Neopians are quickly packing their bags and trying to land a spot for their very own sea-side neohome. Of course with every major decision there are pros and cons to be weighed. And there is no greater choice than picking the location for your neohome. So why not take a step back and put down the packing tape while I take you through the pros and cons of a home on Krawk Island. A Booming Economy: With the recent remodel of Krawk Island, many Neopians are flooding the sandy shores in order to open new businesses. Why, the spiffy new Warf Wharf is not only cleverly named; it is teeming with small businesses that are pumping dubloons into the local economy. Prices have never been cheaper to buy your very own neohome on the sandy shores of Krawk Island. Seafront Property: The beach is an obvious plus. Nothing is more relaxing than looking outside your window and seeing the waves crashing against the sand. With the water just moments away, your little neopets will be jumping for joy at the thought of having a weekend at sea. Not to mention sailing and fishing have never been easier! Breakfast on the beach, flying kites and sand castle building are all new pastimes you’re sure to pick up after living on Krawk Island for a bit. Privacy: With its location so far out in the ocean, your privacy is nearly guaranteed. The tiny island promotes a sense of closeness with your neighbors without the trouble of noisy tourists flocking in every other day. Not to mention the peace and quiet will certainly help you catch up on your beauty rest. And if you’re not a fan of neighbors at all, you can get a plot of land in the deep jungle and avoid folks all together. The View: Alongside the beautiful ocean there are of course the jungles around Krawk Island. It has a little bit of everything for those rather adventurous neopets. Rock climbing, cliff diving, swimming and hiking have never been so easy. Not to mention a day away from the hustle and bustle is easy when you’ve got such beautiful scenery to explore. Not only that, but you can always walk along the shore and watch the boats sail by. And let’s not forget sunset or sunrise while sitting in the sand or wading in the water. Krawk Island has arguably the best view in all of Neopia. The Weather: Of course, with an island neohome, you have to worry about the weather at some point. Whether it be a hurricane or the humidity, the weather might not be for you if you don’t like inconstancy. Be sure you can handle the muggy, humid climate and always be prepared to deal with random tropical storms that might pop up out of nowhere. Tidal waves could easily shake the foundation of your new home and ruin it. 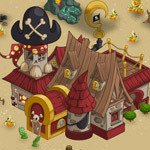 Pirates: It is an island full of pirates. Let’s be honest; they are sneaky, thieving and smelly. If you have young neopets, they might not be the influence you want around. Also be aware that if you have valuables in your neohome, it might be best to lock them away. And are you willing to run the risk of them breaking into your neohome and thieving your vase or a chair? Pirates are always looking for something to sell at Smugglers Cove. And with pirates come scurvy. 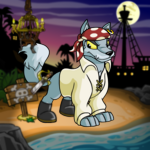 Are you willing to spend thousands of neopoints on cures for diseases those smelly pirates give you and your neopets? The Currency Change: Speaking of neopoints, there’s another problem. Everything on Krawk Island is paid for in dubloons. It can and will be a real pain to change all your neopoints to Dubloons, not to mention the rising cost of Dubloons means you’ll probably lose some cash in the transaction. Ask yourself if it’s worth trading your hard earned neopoints away just so you can live on Krawk Island. Also make sure you’re the kind of person who will keep up with constantly exchanging your neopoints to dubloons or you run the risk of not having the money to buy what you need. Random Acts of CRAZY: Let’s be real here, Krawk Island has had a rough couple of years. After a ship of rogue shipmates crashed into the island, it hasn’t been the same. And lest we forget that for a few weeks the island itself went up and missing because of a Kraken. Insurance surely won’t cover Kraken attacks. And who knows what else might plague the tiny island in the upcoming months. Be sure you’re ready to deal with the unexpected if a piece of Kreludor flies out of orbit and lands on your house. There are a multitude of things that could go wrong while you try and set up your little island home. Be prepared and don’t rule anything out. Stranger things have happened! And there it is! The pros and cons of a Krawk Island neohome. Remember every location has its pros and cons. As you can see, there are always two sides of the coin, er, dubloon. Whether you decide that Krawk Island is the place for you or not, you must always remember a few things. One, a neohome is a serious commitment. Make sure that you choose wisely before you decide where you’re going to make your home. Two, make sure to explore your options. Krawk Island might seem like the perfect place to build your neohome, but you might be surprised. Never count out another world until you give it the twice over. And finally, make sure that above all else you’re happy with your choice. You’re the one who is going to be living there. Be sure that you are content with wherever you choose to make your home and don’t let anybody, including me, try and talk you out of the decision you’ve made.